Celsius Resources (ASX: CLA) has released promising initial assay results from drilling at the Opuwo Cobalt Project in Namibia. 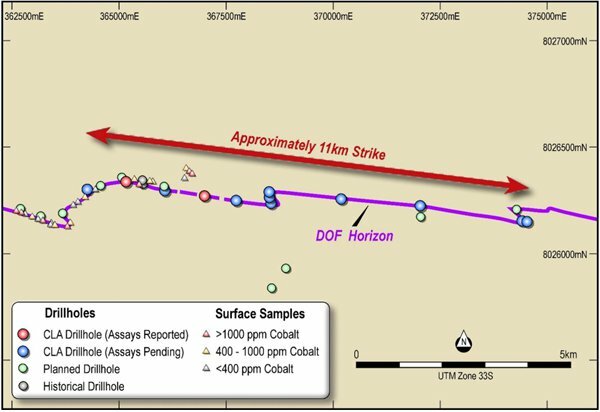 Assays from samples from the first four holes confirmed strong cobalt-copper-zinc mineralisation at locations approximately 400 metres west and 1,500 metres east of the two historical holes drilled in 2015. As indicated below this has extended the strike length of mineralisation confirmed by drilling assays to 1.9 kilometres. Importantly, mineralisation extends to surface and outcrops in many places, and while the company has only limited assay data to draw on, grades appear to increase with depth. Of significance is the fact that CLA’s Managing Director, Brendan Borg who has extensive ‘on the ground’ experience, having developed and managed projects for majors such as Rio Tinto, indicated further positive news flow may be imminent. Although, CLA is at an early stage and anything can so investors should seek professional financial advice before considering this stock for their portfolio. More specifically, Borg said, “These first results exceed our expectations in terms of grade and thickness, and we are very pleased that we have now intersected the target unit over a distance of some 11 kilometres”. Borg has had significant experience in mining for battery material metals (graphite, lithium and cobalt), and comments suggesting the prospect of further near-term positive news are likely to resonate with investors. On this note, Borg said, “The presence of high grade zones of cobalt and copper within the mineralised zone identified to date provides confidence that there is significant upside still to be uncovered at Opuwo and we look forward to progressing our rapid evaluation of the project”. 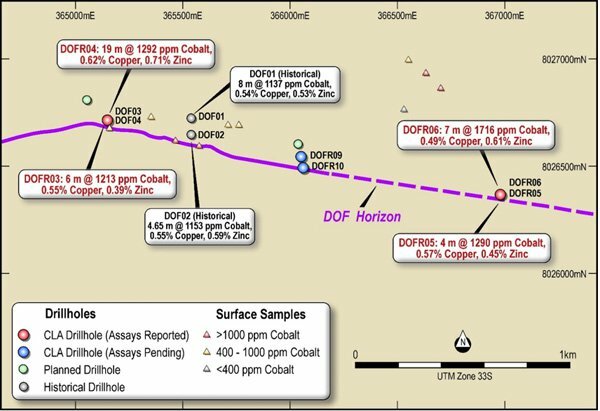 Impressive cobalt-copper-zinc mineralisation identified in assays from the first four holes are shown below. Notable high grade zones within these intersections included 7 metres grading 1321 ppm cobalt and 2 metres grading 3075 ppm cobalt. From a strategic perspective, the exploration results are extremely encouraging given that the underlying focus on this area was to a significant degree based on two discovery holes drilled in 2015. Current drilling has yielded average grades and thicknesses in excess of what was recorded from the holes drilled in 2015. It is also important to note that some drill holes were designed to intersect the mineralised zone at right angles and provide an approximate true thickness while other holes were drilled oblique to mineralisation. Consequently, further investigation at depth of angular holes could provide confirmation of higher grades at depth. With regards to ongoing drilling, 20 shallow holes have been completed for 1627 metres. This initial phase is designed to test a 20 kilometre strike length of the cobalt copper mineralised Dolomite Ore Formation (DOF) horizon and the mineralisation hosted within it. Wide spaced drilling has been completed across 11 kilometres of strike as shown below with the mineralised horizon intersected in each drill ‘fence’ to date. Diamond drilling will commence in early May, providing samples for first-pass metallurgical testing. The planned metallurgical studies, along with preliminary mining studies and resource definition drilling are expected to contribute to a scoping study for the project, planned for completion before the end of 2017. 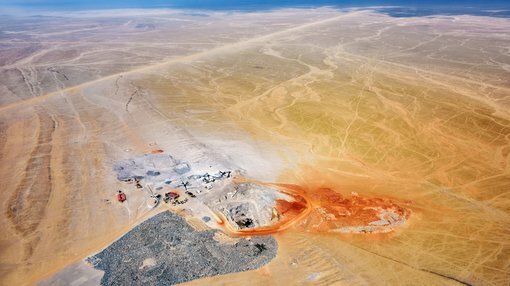 As a backdrop, the Opuwo Cobalt Project is located in north-western Namibia, approximately 800 km by road from the capital, Windhoek, and approximately 750 km from the port at Walvis Bay. CLA is gaining exposure to the project via a staged investment in exploration activities. This involves the earning of an initial 30% interest through the expenditure of $500,000 within 6 months of exercising the option to proceed. A further 30% will be earnt following expenditure of a further $1,000,000 within 12 months of completing the stage 1 earn in, and a final 16% can be earnt following expenditure of a further $1,000,000 within 6 months of completing the stage 3 earn in. Following the earning of the 76% interest, all parties will be required to contribute to exploration.